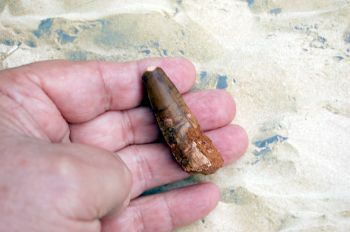 This authentic Spinosaurus tooth was found in Morocco. Spinosaurus probably had over 70 straight conical teeth that lacked serrations. They also varied greatly in size and length. Most of the teeth found are under 3 inches long without the root. However, a few teeth up to 12 inches long including the root have been found. Spinosaurus was the biggest of all the carnivorous dinosaurs, larger than Tyrannosaurus and Giganotosaurus. It lived during part of the Cretaceous period, about 112 million to 97 million years ago, roaming the swamps of North Africa. 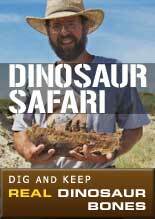 Spinosaurus was first discovered in the early 1900's by German paleontologist Ernst von Stromer. During the second World War, Allied bombs inadvertently destroyed the only significant remains of the sail-backed predator. Two Spinosaurus species have been named based on the regions where they were discovered: Spinosaurus aegyptiacus Egyptian spine lizard) and Spinosaurus maroccanus (Moroccan spine lizard). Spinosaurus means "spine lizard," an appropriate descriptor, as the dinosaur had very long spines growing on its back to form what is referred to as a "sail." The distinctive spines, which grew out of the animal's back vertebrae, were up to 7 feet (2.1 meters) long and were likely connected to one another by skin. Recent fossil evidence shows Spinosaurus was the first dinosaur that was able to swim, and likely spent most of its life in the water, according to a study published September 2014 in the journal Science. "Spinosaurus had short hind limbs (like early whales and other animals that spent more and more time in the water), dense and compact bones (penguins show a similar bone profile in cross section), wide and flat claws and feet (possibly used in paddling), and a long and slender snout with conical teeth (perfect for catching fish)," said Nizar Ibrahim, a University of Chicago vertebrate paleontologist and lead author of the study.